When you have dream and the determination to live up with your dream, you will cherish it, no matter what comes your way. Dr Ajay Data who once determined to get into ISP (Internet Service Provider) Providers in India, never gave up and is now a leading name in this field. 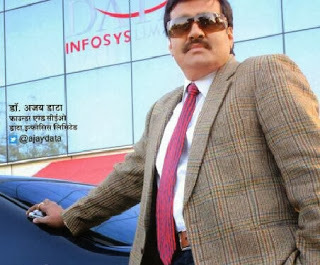 Ajay Data who hails from a business background family in Jaipur had very well guessed the future of Internet and ISPs, so to tune with it, he tried contacting 'Satyam' the leading ISP during 1998 for partnership. Ajay didn't find the terms and conditions set by Satyam reasonable enough for partnership and hence he backed out from partnering with them and started his own venture 'Data Infosys' from scratch. Ajay first looked for his own cities Jaipur, Jodhpur, Ganganagar etc. in Rajasthan to start with and then started extending his venture to next level. Ajay's Data Infosys is now the leading name in the ISPs not only in Rajasthan but whole of India mainly in Northern India. Ajay never distracts from Laurels and he always keeps a tab with the pace of technology, so he started thinking of extending his venture from ISPs to email Service provider and also looked into the spamming of Emails very strictly. Ajay in this effort developed the most advanced Email server (Xgen Plus)which can send and receive 100MB of attachment between two physical points in least amount of time with no spamming facility in built. Ajay is also known for his most awarded Spamjadoo solution which is almost perfect in distinguishing the genuine mails and spam mails and keeps your mails free from spamming always. Dr Ajay Data graduated from Rajasthan University, did his MBA from Newport University USA and then went for PhD in Electronics Data Processing to Netherlands. The “Man to Watch in 2004” by Times of India. Pride of Rajasthan by “Dainik Bhasker"
GUNEEJAN Award given by Hon’ble Governor of Rajasthan.